Asia-Pacific is home to some of the largest consumer and largest importer countries of natural gas in the world. World’s top four LNG importers, India, China, Japan, and South Korea, are all located in the Asia-Pacific region. This region is still primarily dependent on oil and coal to meet its energy needs. But the trend is shifting toward increasing use of natural gas, due to growing concerns over air pollution. The growing use of gas is expected to drive gas turbine market in the region, during the forecast period. Though the countries in the region are trying to move from coal & oil to gas, for power generation; a major obstacle to this approach is the lack of infrastructure for gas transportation. The United States faced a similar situation in the past. The US gas supply and transmission contracts in the 1970’s were long-term and heavily regulated. But in mid-1980s, the supply of gas overtook the demand. The oversupply of gas, coupled with reforms passed by the US Congress, resulted in the liberalization of gas market, and in turn, increased share of gas in total energy consumption. Currently, the Asia-Pacific region faces a similar situation. The gas market in this region is inflexible, but with low gas prices, countries have the opportunity to increase the share of gas in total energy consumption, by introducing reforms to liberalize the gas market. 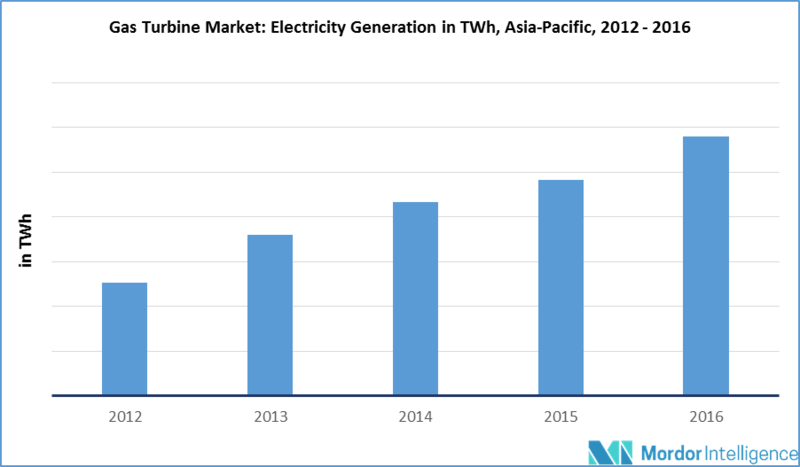 If this opportunity is captured by major countries in the Asia-Pacific region, it will result in substantial growth in gas-fired power generation, in turn driving the gas turbine market. In China, the aeronautical industry (the biggest consumer of gas turbines in the world) is expected to grow at a significant rate during the forecast period. A Chinese aeronautics company, Commercial Aircraft Corporation of China (COMAC), on May 5th, 2017, successfully flew the large passenger jetliner, C919. The first large passenger aircraft manufactured by a Chinese company. COMAC is also the first aeronautics company in the Asia-Pacific region to manufacture a large passenger jetliner. The COMAC has already received orders from different customers for 730 aircrafts. The growing aeronautical industry is expected to drive the gas turbine market in the country, during the forecast period. Nexif The Power generation and manufacturing industries are the biggest consumers of natural gas in this region. Increasing demand for electricity in the region, particularly in the emerging countries, is expected to drive natural gas demand, due to industrial growth, increasing population, and growing middle class. The growth of the power sector is expected to drive the demand for gas turbines. One of the major obstacles faced by countries in the Asia-Pacific region, such as India and China, is lack of infrastructure for domestic production and supply of gas. The lack of infrastructure is preventing these countries from increasing the share of natural gas in the total energy consumption. China has started addressing this problem. During 2013-2016, gas production in China registered a CAGR of 4.3%. January 2018: Energy was awarded an EPC contract by the Thailand Government, for 110 MW gas-fired cogeneration power plant in Thailand’s Rayong province. January 2018: Government of Myanmar gave a clearance to private investors, to develop four large gas-fired power plants in the country. The four power plants collectively have a capacity of 3000 MW. Major Players: General Electric Company, Siemens AG, Mitsubishi Hitachi Power Systems Ltd, Solar Turbines Incorporated, Bharat Heavy Electricals Limited, Harbin Electric Co. Ltd, Ansaldo Energia SpA, Kawasaki Heavy Industries Ltd, Man Diesel & Turbo SE, MTU Aero Engines, among others.